With autumn approaching, you may not be thinking too much about you caring for your lawn. But Fall is the ideal time to prepare your lawn for the following Spring. We have 5 easy steps to preparing your lawn for fall. Keep mowing your lawn: Continue to water and mow your lawn, as needed throughout Fall. As Winter approaches, drop the mower’s blade to its lowest setting for the last two cuttings of the year. Doing this will allow more sunlight to reach the crown of the grass, and there will be less leaf to turn brown. 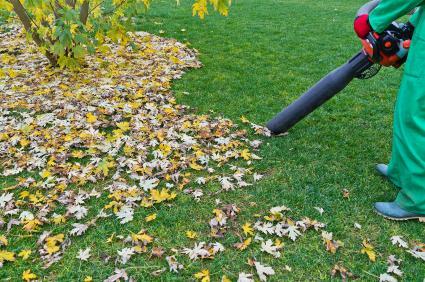 Rake the leaves: It’s important to remove fallen leaves from your lawn as soon as possible to prevent fungal diseases choking the grass below. Fertilize: Many lawn experts recommend fertlizing in the Fall as grass leaves grow much slower in cooler weather. The grass roots will still grow quickly. When fertilizing in the Fall, essential nutrients are delivered to the grass so that deep roots can grow for the Spring season. Fill in the bald spots: This time of year is perfect to fix any bare spots in your lawn. To quickly do this, use an all-in-one lawn repair mixture. You can find this at any home and garden center. After scratching loose soil in the bare spots of your lawn, apply a thick layer of the lawn repair mixture to the area. Water thoroughly and water every other day for two weeks. Controlling weeds: Many weeds are energy-absorbers in the Fall. They drink in everything from water to weed killers. Fight back with a strong weed killer, using it when temperatures are consistently above 60 degrees Fahrenheit. By giving your lawn attention now, you will be rewarded with a lush lawn in the Spring. If you will be away for the Fall and Winter season, our services can help keep your lawn beautiful through the season, just give us a call! fall tips, lawn care, maintenance. permalink.